Today is the Autumnal Equinox, the first day of Autumn, that perfect balance of light and dark. I’m truly a summer girl but Autumn certainly has its charms. Our temperatures are cooling but still nice and warm during the day. This coming week we should see highs in the 80s and lows in the 50s which is pretty darn near perfect. Over the past couple of weeks as I’ve walked Shiloh I’ve been taking note of the changes. Some of the leaves are changing color, the Virginia Creeper has turned red, the goldenrod is in bloom and even a few leaves have fallen. The angle of light has changed and has a golden quality to it which is truly gorgeous. Of course the hours of light have lessened and that part isn’t quite so appealing to me but I’m trying to ignore that for now. In recent years I have come to dread winter with a passion. I truly despise being cold and I dislike having to wear a lot of clothes. Or “real” shoes. However, I did some thinking about it and determined that it just isn’t a good idea to dislike approximately 1/4 of every year. Life is too short for anything less than embracing each and every day. That has really been brought home to me as we’ve attended several funerals in recent weeks, including one for an 18 year old yesterday. Last year I did try to look on the bright side of the colder months and made myself an “Autumn Bucket List”. I didn’t complete everything on it so I’m pulling it out and giving it another try. One thing on the list was to buy a fire pit so we could enjoy the outdoors a bit longer. We finally bought one in June for David’s birthday party. It was just barely cool enough to use it for the party and we haven’t used it since. Tonight I’m hoping to talk David into building a little fire and enjoying a bit of stargazing before we go to bed. In fact, I’d like to make it a nightly ritual until it gets too cold. Something I really do love about fall is pumpkin bread. I’ve got several cans of organic pumpkin in the pantry and I just might bake some this week. I’ve also got some sourdough starter on the counter which should be ready to start baking with in about a week. There’s nothing quite like home-baked breads and I intend to get back to baking all of ours again as the weather cools. While I’m generally loathe to switch from summer to autumn decorations too soon, I did buy a couple of pumpkins for the porch and will probably pick up some mums soon. 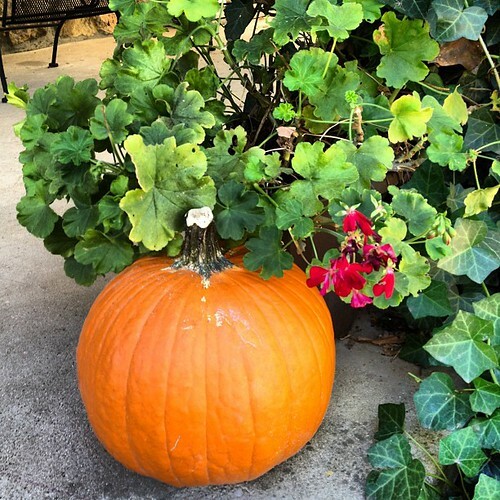 In the meantime I’m enjoying living on the cusp of seasonal change with my geraniums and pumpkins sharing space on the front porch. And that’s a bit how my life feels right now. I love where I am now but I have lots of plans for the future. I think it’s important to keep growing and changing and embracing new challenges throughout life. There are so many things I want to do and learn and experience. And I’m taking steps to make at least some of those happen. I’ve recently started taking piano lessons which I’m really excited about. I’m also taking an online philosophy course from Berkeley and looking for a good French course. I’m embracing and celebrating change, not only in the seasons but in my life. It’s time to pull out the cozy sweaters and pretty scarves. Time to wash all the afghans and drape them over sofa backs, all softly scented and ready to warm chilled skin. Time to choose a puzzle to work on in spare moments. Time to stock up on hot chocolate and tea. Lots of tea. And it’s also time to take stock of my hopes and dreams and plans and ambitions. Some dreams will be tucked away for later like favorite summer sandals while others will be dusted off and polished up like favorite fall decorations. Autumn is a perfect time for a change in routine. A renewed focus on what (and who!) is truly important. And a cool evening under a starry sky is the perfect setting for pondering these changes. Time to put on a hoodie, pour myself a glass of wine and do just that. I am so glad to have (re)found your blog – I have missed reading your posts! I could absolutely give you a big Amen" to this post. I am a Summer girl too, and seeing Fall arrive usually saddens me, but last year I decided to embrace all the seasons the best I could – time is such a precious commodity in this season of my life. We've gotta enjoy it ALL! Enjoy that firepit and be sure to "wish upon a star" as you're gazing tonight! Sweet Tea: Absolutely. Can't waste a moment wishing for something else.